Along the edges of the Pacific Ocean lies the long arc of volcanic and earthquake activity zones known as the Ring of Fire. It outlines the borders of the Pacific tectonic plate and holds over 75% of the Earth's volcanoes. In the North Pacific, not far from Guam and the Mariana Trench, theres the section known as the Mariana Arc. The Submarine Ring of Fire is an arc of active volcanoes that partially encircles the Pacific Ocean Basin and results from the motion of large pieces of the Earth’s crust known as tectonic plates. This volcanic activity is often associated with “hydrothermal systems” or seafloor hot springs, where heat and chemicals from the interior of volcanoes are vented into the ocean. This process supports unique biological communities. These communities are typically based on chemosynthetic food chains, and some are highly productive. 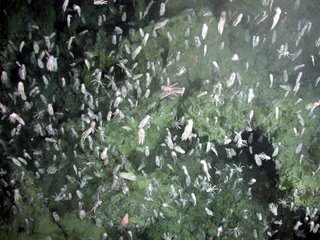 Microbial organisms that are essential to these food chains have unusual adaptations that allow them to survive extreme chemical and physical conditions, including enzymes previously unknown to science. These enzymes are believed to have a high potential for developing new natural products of interest to industrial and medical research. Vent fluids typically have high concentrations of metals that quickly precipitate in cold ocean waters. This process may be directly linked to the formation of ores and concentrated deposits of gold and other precious and exotic metals. At this moment they are leading an international team of researchers to explore the Mariana Arc. The current expedition is Submarine Ring of Fire 2006 (SRoF'06) The explorers left on 18th April on the research ship Melville owned by the Scripps Institution of Oceanography. They are using the ROV Jason to explore the sea floor. The Cauldron. A convecting liquid sulfur pool at 40 atmosphere pressure. The temperature is 187C but crabs flourish in the area. The Brimstone Pit. A volcanic gas and ash vent. They witnessed lava extruding on the sea floor, something never seen before. You can follow their further adventures here.